Injuries to the acromioclavicular (AC) joint, where the collarbone (clavicle) meets the point of the shoulder blade (acromion), usually occur by direct impact to the side of the shoulder. This is often seen in contact sports such as rugby. With mild injuries, the ligaments holding these bones together are partially torn, whereas in more severe injuries, complete tearing of the ligaments occurs with dislocation of the AC joint. Pain and swelling are usually experienced and localised to the top of the shoulder. A bump may be seen over the top of the shoulder if the ligaments are completely torn and the AC joint is dislocated. X-rays are performed to diagnose the injury. Further scans are not usually required. Most injuries (even dislocations) can be treated non-surgically with early shoulder exercises under the guidance of a physiotherapist. This usually allows the shoulder to settle within 6 weeks to 3 months, the latter being the time it may take to return to contact sports. With complete dislocations, surgery can be performed either at an early stage or after a trial of non-surgical treatment if there is ongoing pain and limitation of function. Surgery is usually performed with a small incision over the AC joint and reconstruction of the torn ligaments using a strong synthetic ligament to realign the clavicle back with the acromion. After ligament reconstruction, the shoulder is rested without movement for the initial 2 weeks. You will be followed up in clinic at this point to ensure that the wound has healed, after which gentle shoulder exercises can be started aiming to regain full movement and strength with physiotherapy guidance. The time taken to return to work is dependent upon the type of job with most activities resumed by 6 weeks although it may take up to 3 months to return to full physical work and contact sports. Arthritis affecting the acromioclavicular (AC) joint, where the collarbone (clavicle) meets the point of the shoulder blade (acromion), is often seen with excessive and repeated overhead activities and sometimes associated with previous injuries. The cartilage between these two bones wears away and pain is experienced when the ends rub against each other. 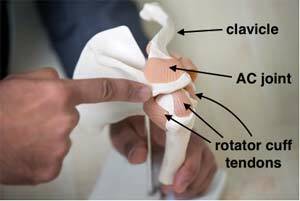 Pain and tenderness are usually located at the top of the shoulder directly over the AC joint. The symptoms are aggravated by lifting the arm above shoulder height (the ‘high painful arc’). Pain medication and activity modification may help to control symptoms. 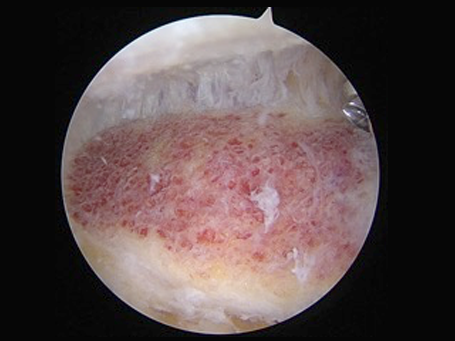 A guided steroid/cortisone injection, using X-ray or ultrasound, can be useful to confirm the source of pain and is often helpful in reducing the pain. 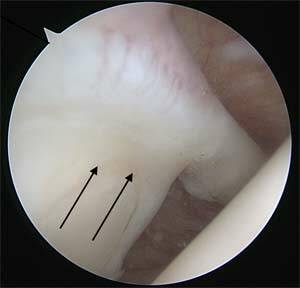 If the pain fails to resolve with the above measures, arthroscopic (keyhole) AC joint excision can be performed, where the outer 5-6 mm of the clavicle is removed to prevent it rubbing against the acromion. Surgery is usually performed as a day case procedure although it may involve an overnight stay if performed later in the day. A sling is worn for several days after the procedure. Unrestricted shoulder motion can then be commenced under the guidance of your physiotherapist. You will be seen in the clinic 2 weeks after surgery. There are no sutures to remove. Recovery is then gradual after this but may take several months to complete. 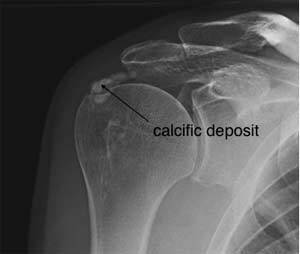 Calcific tendinitis/tendinopathy is a painful condition of the shoulder in which calcium deposits are formed within the rotator cuff tendons. Although the cause is not entirely understood, it is thought to occur as a healing response by the body to ‘wear and tear’ of the tendons. As this causes the tendon to swell, ‘impingement’ also occurs where the tendon rubs on the undersurface of the shoulder blade (acromion) causing further irritation and pain. Pain is usually experienced over the shoulder and upper arm and can be aggravated by reaching the arm away from the body. It may also prevent good quality sleep especially when rolling onto the shoulder at night. X-rays are required to see the calcific deposits. Ultrasound or MRI scans may be performed to identify smaller deposits and also view the rotator cuff tendons if necessary after specialist examination. In some situations, the calcium may dissolve by itself after some time (time period unpredictable) and the symptoms can be controlled by pain medication whilst this is occurring. A steroid/cortisone injection into the affected area or a guided injection directly into the deposit may also help to control the pain. 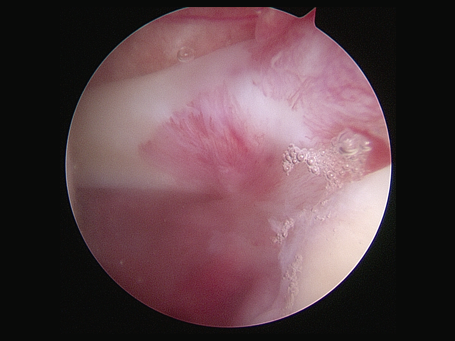 If the above measures fail to resolve the symptoms, arthroscopic (keyhole) surgery to remove the calcific deposits, often combined with subacromial decompression, where the bone spur from the undersurface of the acromion is removed to reduce the pressure upon the tendon, can be performed usually with a good outcome. Frozen shoulder, also known as ‘adhesive capsulitis’ is an extremely painful condition of the shoulder that results in severe stiffness due to inflammation and thickening of the lining of the shoulder joint. The exact cause is unknown although it can sometimes be triggered by an injury or having surgery, and is also associated with other conditions such as diabetes, thyroid and cholesterol problems. Severe pain in the shoulder and upper arm, often constant. Pain often occurs at night preventing good quality sleep. Restriction of movement of the shoulder, which affects daily activities, work and sports. 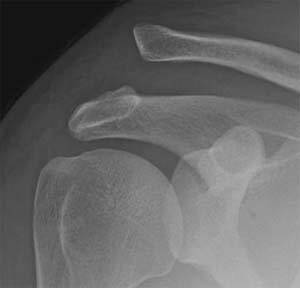 It is important to have an X-ray of the shoulder to rule out other causes of a stiff painful shoulder such as arthritis. It is usually not necessary to have any other tests. Frozen shoulder may resolve by itself without any intervention, although the time taken for this may range from several months to years. Pain medication, steroid/cortisone injections into the shoulder joint and physiotherapy may be useful in the early stages to improve symptoms. Another option if the above is not effective includes ‘hydrodilatation’ whereby 30-40mls of fluid is injected into the shoulder joint under local anaesthetic to stretch the lining of the joint and allow more movement. This is usually effective in approximately 70-75% of patients. 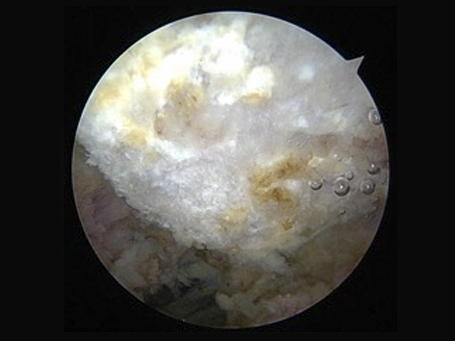 If non-surgical treatments fail, arthroscopic (keyhole) surgery can be performed to release the thickened lining of the joint (‘capsular release) to improve pain and movement of the shoulder. This usually resolves the problem in 90-95% of patients. Surgery is usually performed as a day case procedure although it may involve an overnight stay if performed later in the day. A sling is usually worn for comfort for several days after the procedure. Unrestricted shoulder motion can then be commenced under the guidance of your physiotherapist. You will be seen in the clinic 2 weeks after surgery. There are no sutures to remove. Recovery is then gradual after this but may take several months to complete. The rotator cuff is a group of four muscles (supraspinatus, infraspinatus, subscapularis, teres minor) positioned around the shoulder joint to help stabilise it and control movement of the shoulder. The muscles attach to the shoulder blade and they form tendons that insert into the top of the humerus (arm bone). The tendons run in the subacromial space, an area that is made up of the undersurface of the acromion (point of the shoulder) and a ligament. Subacromial impingement syndrome is a painful condition of the shoulder caused by rubbing of the rotator cuff tendons against the undersurface of the acromion and the thickened ligament lining the subacromial space. This is often associated with a bone spur from the acromion. The rubbing also causes inflammation and thickening of the bursa (layer of tissue lining the rotator cuff designed to help the tendons glide smoothly under the acromion), which causes the pain. An X-ray is usually performed to rule out other causes of shoulder pain such arthritis and also help to show a bone spur. Ultrasound or MRI scanning may be required to identify any associated rotator cuff tears. Pain medication and physiotherapy may help to control the symptoms. A steroid/cortisone injection into the affected area is usually effective at reducing the pain and the combination with physiotherapy may resolve the problem. 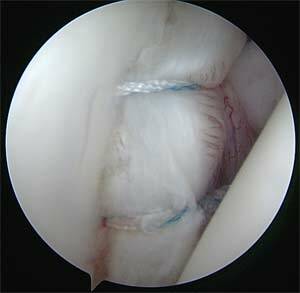 If the above measures fail to control the symptoms, arthroscopic (keyhole) surgery can be performed, where the bone spur from the undersurface of the acromion (subacromial decompression) is removed and the thickened ligament released to prevent the rotator cuff tendons rubbing. The rotator cuff is a group of four muscles (supraspinatus, infraspinatus, subscapularis, teres minor) positioned around the shoulder joint to help stabilise it and control movement of the shoulder. The muscles attach to the shoulder blade and they form tendons that insert into the top of the humerus (arm bone). The tendons may tear from their attachment either after an injury such as a fall (‘acute tear’), or from long-term wear and tear (‘chronic tear’). This may result in pain and weakness of the shoulder and difficulty with day-to-day tasks, work and sports. Weakness may be experienced especially when moving the arm away from the body to perform tasks. This is can also be demonstrated with specialist shoulder examination. An X-ray is usually performed to rule out other causes of shoulder pain such arthritis. Ultrasound or MRI scans are required to confirm the diagnosis – they also provide information regarding the size and position of the tear and help to plan the treatment. Pain medication and physiotherapy can be helpful to control the pain and strengthen the shoulder. A steroid/cortisone injection to the affected area may help to reduce pain and inflammation especially with chronic tears. If the above measures fail to control the symptoms, surgical repair of the tendon is advised. With ‘acute tears’, early urgent surgical repair is more likely to result in a better outcome. 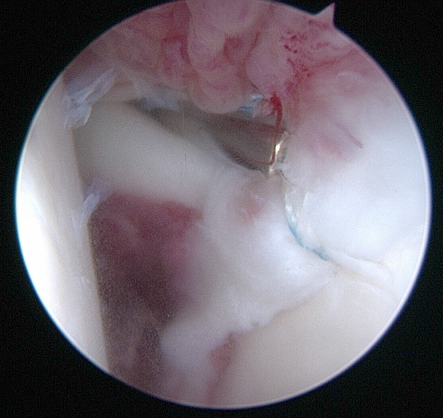 The tendon is repaired with arthroscopic (keyhole) surgery. Arthroscopic rotator cuff repair involves using bone anchors with sutures to reattach the tendon back to its normal attachment on the humerus. Surgery is usually performed as a day case procedure although it may involve an overnight stay if performed later in the day. A sling is usually worn for up to 6 weeks after the procedure to protect the repair whilst it heals. Although this immobilises the shoulder, movements of the elbow, wrist and hand can start straight away to prevent them becoming stiff. You will be seen in the clinic 2 weeks after surgery. There are no sutures to remove. Recovery is then gradual after this but may take several months to complete and will be under the guidance of a physiotherapist. You will be unable to drive until the sling is removed. The time taken to return to work is dependent upon the type of job. Lighter jobs such as office-based work can resume once the shoulder feels comfortable although it may take up to 6 months to return to heavy physical work and contact sports. The shoulder joint comprises of a ball (humeral head) and socket (glenoid) with the greatest range of motion of any joint in the body. This extreme motion is due to the shallow nature of the socket such that the shoulder joint is thought of a golf ball sitting on a tee. The shallow socket is surrounded by specialised tissue called the labrum and capsule that attaches to its rim and makes the joint more secure. 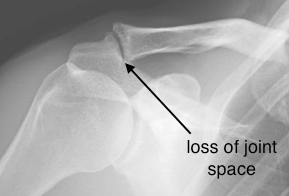 Dislocations of the shoulder usually occur with injuries in young adults, especially with contact sports such as rugby, and result in tearing of the labrum and stretching of the capsule away from the rim of the socket. Although the labrum usually heals after a dislocation, it may heal in an abnormal position that leaves the shoulder loose and prone to more dislocations. The shoulder may dislocate repeatedly or have the feeling of slipping in certain positions such as with arm above the head making it feel untrustworthy. The feeling of the shoulder slipping can also be reproduced during specialist examination to confirm the diagnosis. Pain is not a common feature unless the shoulder has recently dislocated or slipped. X-rays are necessary to look for bone damage to the humeral head and glenoid associated with repeated dislocations. CT and/or MRI scans, sometimes with a dye injection, are performed to visualize the labrum, capsule and bones in more detail to plan further treatment. 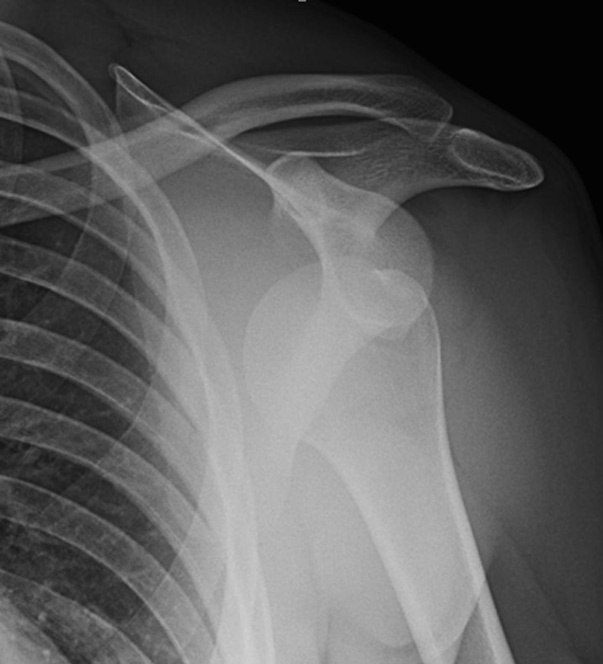 Emergency treatment to reduce the shoulder is required after a dislocation. Once back in position, a sling can be used for comfort and physiotherapy started to restore shoulder function. Physiotherapy is helpful to strengthen the shoulder after a dislocation and may enable it to become stable without any further treatment. Young adults and especially those engaging in contact sports, however, are at higher risk of further dislocations and may require surgical treatment. 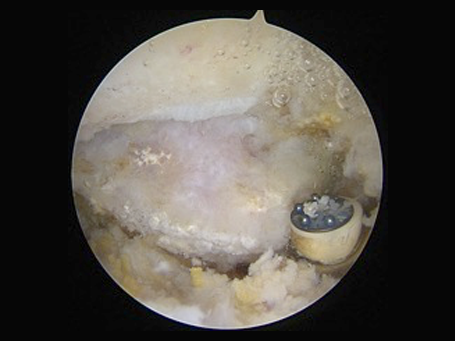 Arthroscopic (keyhole) stabilisation involves the use of specialised bone anchors with sutures to reattach the labrum and capsule back to the rim of the socket. If there is significant bone damage to the socket and/or humeral head, repairing the labrum alone may not be sufficient. In this scenario, a piece of bone (the coracoid) is transferred from the shoulder blade and fixed to the socket with screws to replace the lost bone (Latarjet Procedure), either as an open or arthroscopic (keyhole) procedure. Surgery is usually performed as a day case procedure although it may involve an overnight stay if performed later in the day. A sling is usually worn for up to 4 weeks after the procedure although controlled early shoulder exercises can be started straight away under the guidance of a physiotherapist. You will be seen in the clinic 2 weeks after surgery. There are no sutures to remove. Recovery is then gradual after this but may take several months to complete. You will be unable to drive until the sling is removed. The time taken to return to work is dependent upon the type of job. Lighter jobs such as office-based work can resume once the shoulder feels comfortable although it may take up to 3 months to return to heavy physical work and contact sports. Arthritis of the shoulder joint is where the cartilage lining the surfaces of the ball (humeral head) and socket (glenoid) becomes thin and worn causing pain and stiffness as the surfaces rub together. Pain is usually experienced deep in the shoulder, and aggravated with daily activities such as washing and dressing, and prevents comfortable sleep. Stiffness of the shoulder is often seen when the arthritis is more severe, especially when trying the twist the arm outwards away from the body. X-rays are necessary to diagnose the problem by showing narrowing of the joint space. CT and/or MRI scans may be performed to obtain more information about the shape of the bones, especially the socket, and the rotator cuff tendons and are useful when planning further treatment. Pain medication and activity modification are the main first-line treatments for shoulder arthritis and may make the symptoms more manageable. A steroid/cortisone injection to the affected area may reduce pain and inflammation although might only be temporary. Arthroscopic (keyhole) surgery: this involves removing bone spurs, osteophytes, loose fragments and scar tissue to reduce pain and allow more movement and can help in the earlier stages of arthritis but not an option if it is more advanced. 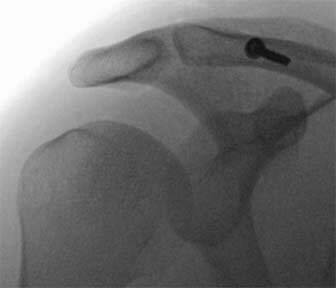 Anatomic shoulder replacement: the worn socket is replaced with a specialised plastic surface and the humeral head is replaced with a metallic ball with a stem. This relies on good quality rotator cuff tendons and muscles to keep the shoulder stable and ‘centred’, and function well after surgery. Hemiarthroplasty: Sometimes it may not be possible to replace the socket due to its shape or position, in which case the humeral head alone is replaced with a metallic ball. Reverse shoulder replacement: this involves ‘reversing’ the ball and socket so that a specialised metallic ball is used to replace the socket, and a plastic socket is used to replace the humeral head and changes the mechanics of the shoulder. This is considered when the rotator cuff tendons around the shoulder are torn or very thin, and allows the shoulder to remain stable and centred so that the deltoid muscle (the large muscle overlying the shoulder) is able to drive the shoulder without the need for the rotator cuff tendons. Arthroscopic (keyhole) surgery: Surgery is usually performed as a day case procedure although it may involve an overnight stay if performed later in the day. A sling is usually worn for comfort for several days after the procedure. Unrestricted shoulder motion can then be commenced under the guidance of your physiotherapist. You will be seen in the clinic 2 weeks after surgery. There are no sutures to remove. Recovery is then gradual after this but may take several months to complete. Shoulder Replacement: Surgery usually involves a 1-2 night hospital stay although this may vary between patients. A sling is usually worn for up to 6 weeks after the procedure. Controlled shoulder exercises are started almost straight away under the close guidance of a physiotherapist and recovery is then gradual after this but may take several months to complete. You will be seen in the clinic 2 weeks after surgery. There are no sutures to remove. You will be unable to drive until the sling is removed. The time taken to return to work is dependent upon the type of job. Lighter jobs such as office-based work can resume once the shoulder feels comfortable although it may take up to 6 months to return to more demanding jobs and sports. It is advisable to avoid heavy physical labour and contact sports, however, due to the potential damage to the replacement and wearing it out. The most common fractures around the shoulder include clavicle (collarbone) and proximal humeral (top part of arm bone) fractures. They are usually a result of falls onto the shoulder with causes ranging from simple trips to high-energy road traffic collisions. Pain with swelling and bruising in the affected area. X-rays are required to diagnose the injury and plan the treatment. CT scans may occasionally be required to gain more information about the injury before deciding upon a treatment plan. Most fractures where the bones remain in position can be treated non-surgically usually with a sling for comfort. 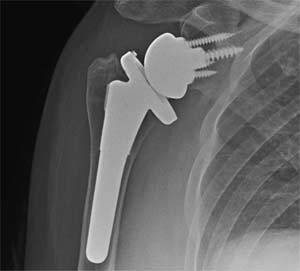 If the bones are significantly out of position, surgical fixation with metal plates and screws may be the best treatment to enable the fracture to heal correctly and restore shoulder function. With severe proximal humeral fractures in older patients, fixation of the bones may not be possible if they are soft and fragmented. 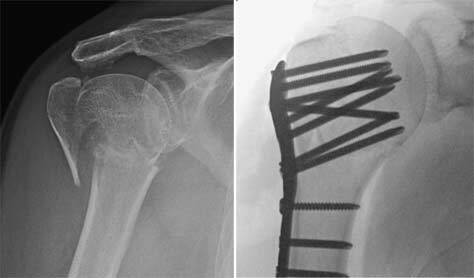 Replacement of the shoulder with either a hemiarthroplasty (replacing the humeral head with a metal ball) or a reverse shoulder replacement (see section on shoulder arthritis) is more likely to provide a reliable outcome in these patients. The recovery and rehabilitation period is dependent upon the injury and its severity. A sling is usually worn for up to 6 weeks after the procedure although controlled early shoulder exercises under the guidance of a physiotherapist can usually be started soon after surgery. You will be seen in the clinic 2 weeks after surgery. There are no sutures to remove. Recovery is then gradual after this but may take several months to complete. The shoulder socket (glenoid) is lined by specialised tissue called the labrum that attaches to its rim and is important for joint stability. The biceps tendon runs in the shoulder joint and attaches to the top (superior) part of the labrum. Injuries such as falling onto the shoulder, dislocations and repetitive overhead activity, such as in throwing sports, can cause tearing of the superior labrum known as a SLAP (Superior Labrum Anterior to Posterior) tear. Pain is usually experienced deep in the shoulder aggravated by overhead activities such as throwing. Clicking in the shoulder may also be present. An X-ray is usually performed to rule out other causes of shoulder pain. An MRI scan with a dye injected into the shoulder (MRI arthrogram) is the best way to diagnose a SLAP tear. Pain medication and physiotherapy may be helpful although most SLAP tears fail to settle especially in young adults that play regular sports. 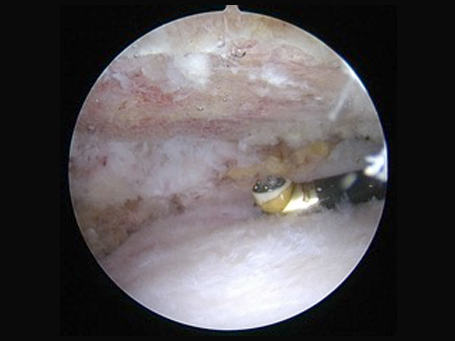 If the symptoms persist, arthroscopic (keyhole) surgery can be performed to reattach the torn labrum back to the rim of the socket using specialised bone anchors. Surgery is usually performed as a day case procedure although it may involve an overnight stay if performed later in the day. A sling is usually worn for up to 4 weeks after the procedure although controlled early shoulder exercises under the guidance of a physiotherapist can be started straight away. You will be seen in the clinic 2 weeks after surgery. There are no sutures to remove. Recovery is then gradual after this but may take several months to complete.